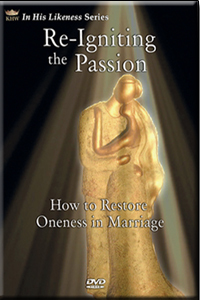 This new and unique DVD series about restoring oneness in marriage contains two DVD’s with four 45 minute sessions. Also included is one CD with a facilitator’s package for printing. This DVD includes drama with Christian actors, counseling sessions with a Christian counselor, and Biblical teaching on marriage and communication. Biblical teaching is provided using extensive visual helps, including a 3-D walk-through of Solomon’s Temple. True-to-life dramas that highlight the problems so many Christians face in their marriages. Counseling sessions that clarify the problems and present solutions.